Several countries throughout the world have contributed to the idea and invention of animation. 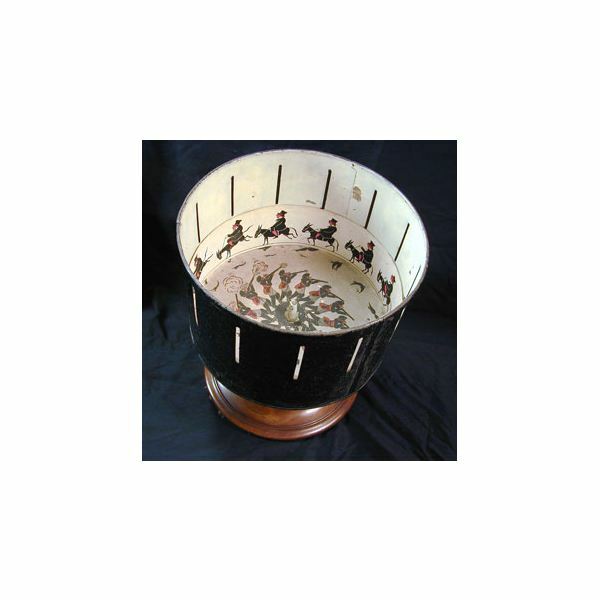 Zoetrope: the original Zoetrope in 180 AD, invented by Ting Huan, from China, was an illusion that, when spun, made the images appear as though they were moving; the modern Zoetrope was founded by William George Harner from Britain in 1834 (see photo). Flip book: patented by John Barns Linnet in 1868. Praxinescope: France 1877, invented by Charles-Emile Reynaud who made the world’s first animated film which screened in Paris, France on October 28, 1892 with his prototype of the modern projector he called the Théâtre Optique system (invented in 1889). However, even before these early projectors, the first animation of the world dates back to 5000 years ago, found in present-day Iran (Persia), an animated earthen goblet, depicting a goat jumping to a tree to eat the leaves. Also, animation has been depicted in cave drawings. Animation is divided into three categories: traditional animation (includes cel-animation), stop motion (includes claymation), and CGI (computer generated imagery). Even today, as it was often done in the past, any one of them may be congruently combined or even used with live-action, e.g. “Who Framed Roger Rabbit?" (1988). Traditional animation was at one time the most popular type of animation, dating back to the early use of animation in films. Traditional, or classical animation as it’s also called, originally consisted of hand-drawn images on each, single frame, including the background. Later, with the invention of cel-animation, founded by Earl Hurd in 1914 (while employed at John Bray Studio), animation would progress even further. Cel-animation was a technique used in which the animated ink drawings were inked directly onto clear pieces of celluloid, each frame individually. Then, each piece of celluloid, one at a time, was placed on a single painted background and then photographed consecutively. Since this saved plenty of time, because the background didn’t have to be reproduced for each frame, other animation studios began copying this technique. Today, traditional animation is done digitally on a computer, with “digital ink". *Even though Earl Hurd, in 1914, invented the cel-animation technique, unfortunately, it was John Bray Studio who received the credit for this innovative method. It was misfortunate that the early animation studios didn’t credit their artists and only thought of fame and monetary gains for themselves. Otto Messmer, “Felix the Cat" creator, when employed by the Pat Sullivan Studio, experienced the same unfairness as Hurd. Not once in his entire life did he receive recognition or even monetary gain (Pat Sullivan made millions from Messmer’s creation). This also happened at the Walt Disney Studios; except Disney is said to have acknowledged his artists; however, Disney, like Pat Sullivan, received millions from his artists’ creations. For instance, it was Freddie Moore (Robert Fred Moore) who should have received the public attention (while he was alive) for his innovative style towards realistic motion; this exceeded beyond the ‘rubber hose’ style of the day. In stop motion animation, or stop-action, an object is slightly moved (object animation), then photographed, one frame at a time. Clay animation (or ‘Claymation’ registered trademarked (1978) by Will Vinton) and pixilation, both initially first used in 1908. The U.S. clay animated film, created by The Edison Manufacturing Co. (later known as Thomas A. Edison, Inc.) called “The Sculptor's Welsh Rarebit Dream" (1908) is the first known clay animation. “El hotel eléctrico" (The Electric Hotel) (1908), a Spanish film created by Segundo de Chomón, is an early example of the use of pixilation. There are other variations of stop motion techniques: go motion, stereoscopic, and CGI stop motion. Go motion was first used in 1980 in “Star Wars Episode V: The Empire Strikes Back" and was created in order to give a more realistic movement to the object(s) in the frame. Since each object, when shot using stop motion, is in crisp clear focus within each frame (which doesn’t realistically represent movement to the human eye), go motion provided the necessary effect to make a subject’s movement more life-like by creating motion blur. When shooting go motion, the subject, while being recorded, is moved. This creates motion blur. Although there are now multiple ways to make a subject move while it’s being recorded, one way is to use rods to control the object. Stereoscopic (‘two’ images) animation refers to 3-D animation. One way to create 3-D images with object animation is by the use of a binary lens system (aka point-and-shoot stereo cameras), a single camera built with two lens. Another way to produce 3-D images is with the use of a computer and CGI software programs. CGI animation is a combination of computer generated imagery with animation techniques, and because of the advancements of computer technology and software, is now becoming the preferred style of animation. The difference between CGI and other types of animations is that everything is manipulated with a computer, one frame at a time. Each frame, after manipulation, must be rendered, and because of this, a fast computer is necessary. CGI initially started in the early seventies with the advancement of computer technology and software. However, it wasn’t until recently, with the use of motion capture that CGI characters have become increasingly more realistic. The first animated film on standard film, which ran just over three minutes long, was created by J. Stuart Blackton in 1906 called “Humorous Phases of Funny Faces"
“Snow White and the Seven Dwarfs" (1937) was the first cel-animated feature film, directed by David Hand. The earliest surviving animated feature, which had color tinted scenes was “Adventures of Prine Achmed" (1926). “Superman" (1978) was the first CGI film title. “Toy Story" (1995) was the first feature film to completely use CGI-animation. “Coraline" (2009) was the first stop-motion 3-D feature film. It used 3-D printing technology. 3-D printing technology is a new technique used to copy 3-D images from a computer into actual 3-D models. You don't have to have a fancy computer and tons of training to get started in animation. Learn to make your own stop motion movie. "Film History." Kristen Thompson, David Bordwell. 2003.